Ingredients: Aloe Vera Juice, Vegetable Glycerin, Organic Grapeseed Oil, Organic Shea Butter, Extracts of Linden Blossom, Panax Ginseng, Organic Green Tea, Mango Butter, Kokum Butter, Vegetable Emulsifying Wax, Red Palm Super Olein, Organic Coconut Oil, Meadowfoam Seed Oil, Hydrolyzed Wheat Protein, Hyaluronic Acid, Acai Berry Fruit Extract, Apple Fruit Extract, Rosehip Seed Oil, Witch Hazel Extract, Avocado Butter, DMAE, Sesame Seed Oil, Gluconolactone (from corn) and Sodium Benzoate (food grade preservative), Gardenia Flowers Extract, Tocopherol (Vitamin E), Rosemary Essential Oil. To use: Apply cream morning and night or as often as needed onto freshly cleansed skin. Can be used alone or under makeup. For best result use after Fleur De Lis Natural Cosmetics Rice and Papaya Enzyme Powder Cleanser. PURE AND NATURAL - No Parabens or Formaldehydes, No Propylene Glycol or Mineral Oils, No Artificial Colors or Artificial Fragrance RED PALM OIL is derived from the fruit of the palm tree and gets its name from characteristic dark red color. It was prized by the pharaohs of ancient Egypt as sacred oil for its nutritional and healing properties. SUPER ANTIOXIDANT - Red Palm Oil is also one of the richest natural sources of vitamin E. In addition to ordinary vitamin E, it contains the highest amount of a super potent form of vitamin E known as tocotrienol. There are four tocotrienols. Red Palm Oil contains all of them. These tocotrienols have up to 60 times the antioxidant activity of ordinary vitamin E. The combination of vitamin E, tocotrienols, carotenes, and other antioxidants makes Red Palm Oil a super antioxidant. 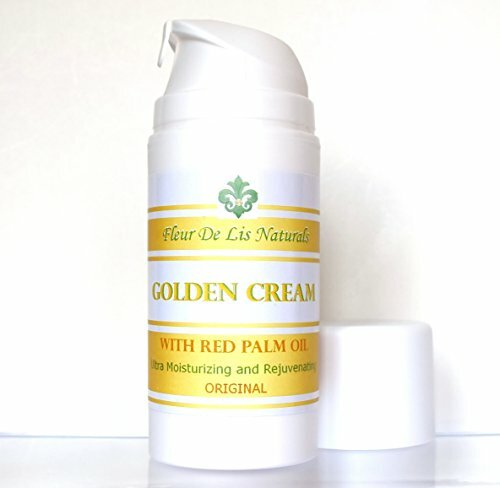 NATURALLY SCENTED with divine aroma of Tiare (Gardenia) flowers from Tahiti NOURISHING AND REGENERATING - This all natural cream combines ultimate skin restoring benefits of Red Palm Oil with purifying and soothing Aloe Vera Juice.